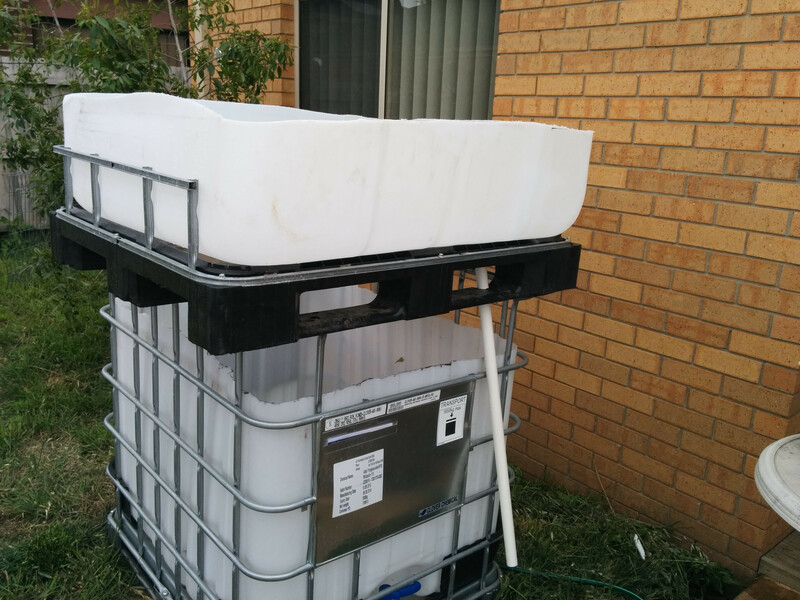 Backyard Aquaponics • View topic - where to buy expanded clay, fish and other stuff in Melb? So before i start permanently attaching, or filling up the top part with clay (i would need a second person to move it, or maybe a 3rd) - looking at the below, got a second IBC, cut a GB out of it, and am using the whole new frame to put the GB on. Its a little high, so i thought id ask others opinions before i fill it. Quite happy to get a small step or ladder to pick stuff. Or should i revert back to the original frame and have it significantly lower? For access to the fish, ive cut the bars just above the warning label, including the top cross bar, so when i slide the GB back, i have plenty of easy access. just realised i can probably drop it down 30cm or so by removing the pallet base. Still might be a tad high, but less so. ok tried the old frame, just because unscrewing the new one would only give me 10cm and was being a lot more work than expected. GB fits much better on this one, but its a few cm too low. Off to bunnings to get some small bricks to add height. More pics later. Hoping the weather holds.